Time to get seriously Xcited! The Prophet X is a fresh and inspiring hybrid synth that encourages you to explore sound-making in new ways, with unique results. Solid build, intuitive and fun. Lots of modulation routing available. You can run out of polyphony in 8-voice mode when using dual layers. No way to allocate voices flexibly per-layer. No way to bypass effects for just the sample or synth on a single layer. DSI’s hybrid products such as the Prophet VS, Poly Evolver and Pro 12 still deservedly have numerous users and in many ways the Poly Evolver is the prequel to DSI’s latest hybrid, the Prophet X.
Badged as a Sequential product, the Prophet X looks menacing with its dark grey metal case and chassis, grey-stained wooden end cheeks, warm orange backlit wheels and switches and dual assignable touchstrips. Build quality is solid; all the switchgear and knobs feel tank-like and very roadworthy. 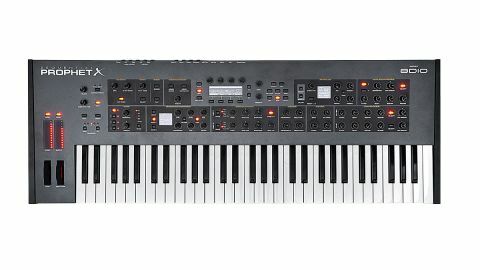 Prophet X’s 61-note velocity/aftertouch enabled keybed also feels very high-quality and, although it’s a little more stiffly sprung than the Prophet 6, this does give you more detailed control over the acoustic instruments and velocity-switched samples! We do think 73 or 88-note weighted options would be appropriate here. Generally speaking though, anyone with previous DSI experience (and new users too) will feel at home - the X is intuitive despite its complexity. Accurately described as a Sample+Synthesis product by its makers, the X features a hybrid 16-voice mono/8-voice stereo engine with four oscillators per voice. The final two oscs are labeled instrument 1 and 2 and are 16-bit/48kHz sample playback oscs which instantly stream/load multisamples (no delay on load which is great) from the built-in SSD drive. 150GB of the included content is dedicated to multisamples provided by Sequential’s ‘deep-sample’ partner 8DIO, with a further 50GB of space available for user samples and ‘add-on’ libraries from 8DIO. You can import these additional libraries or your own samples via the sample import connection using a USB stick, although user-sample import isn’t due to become available until December 2018. Rest assured though, there’s plenty of high-quality content included and with all the many synthesis/processing features onboard, you can mangle all this content up beyond recognition easily. Loading sampled instruments is instant and easy using the dedicated instrument OLED screen/knobs - this screen is handily split in half, with the top half for Instrument 1 and the lower half for Instrument 2. Turn the Type knob and you can select from the 17 sample categories (pianos, cinematic, synth, keyboards etc) and then scroll through the instruments available in each category (to hear them, turn up the Instrument 1 or 2 knobs in the mixer section). There are also dedicated sample-edit knobs to tweak the start, end and size/centre of the looped area within any sample in real time (all modulatable), plus there’s dedicated loop and reverse buttons, along with ‘sample stretch’ for each instrument too which allows you to freeze the last played note/ velocity and instantly map it across the keyboard (so you can grab a snare out of a multi-mapped drum set, for example). In addition, you can choose whether your samples route through, or bypass the analogue LPF. Talking of layers, the X is 2-part multitimbral and can be addressed over MIDI as two separate synths. Like the REV2/P12, you can stack both layers (each with four oscillators running simultaneously), or place each layer either side of a user-defined split point. Notably, a single layer with two samples and two synth oscs panned/detuned/modulated/ effected can sound huge on its own, so layering isn’t essential by any means. However if you do layer, be aware that if you want to run the X as an 8-voice stereo synth (the filters/signal path are stereo and each filter can be moved to the left or right in the stereo spectrum), once you split or stack a sound, you are effectively halving each layer’s polyphony to four voices which can result in voice- stealing when playing bigger chords (and you can’t allocate voice flexibly per-layer). Thankfully, the ‘16-voice’ button allows 16 voices simultaneously in mono when you require more polyphony from layered/ split patches, though you do lose the beautiful stereo filters and stereo panorama of the stereo samples here (though the effects still remain stereo). With this in mind, we’d love a Prophet XL with 32-voice mono/16- voice stereo voices but having said all this, to use the X just as a ‘rompler’ isn’t really its remit; the more eclectic choice of samples onboard instead push you to use the key characteristics from these samples to create entirely new layered, complex sounds. Furthermore, 8DIO’s samples are much more characterful than most samples you’ll encounter in other keyboards; these get much closer to deeper DAW-libraries in authenticity, character and vibe, so you’ll find some very expressive strings, superb tuned percussion, quirky prepared pianos, lush choirs/ single voices, very playable ethnic instruments, noises, synth waves, varied drum kits and some decent EPs/organs and woodwinds/brass too. The synthesis engine sounds much like the Prophet 12 engine (but with a new filter design and fewer wave options). Similarly, it’s not as vibey as the VCO-driven Prophet 6 but the more precise nature of the digital oscs complements the sample engine well. Each digital osc has sine, sawtooth, pulse and supersaw waves (like the Pro 2) plus variable shape mod per-wave, so you can make all manner of classic warm sounds and more modern-sounding evolving patches too. These waves can be instantly layered (singly or together) with the sampled instruments, by simply turning up the Osc 1 and 2 volumes; you can achieve some nicely fresh, deep and textured sounds with very little effort. Four-way-blended sounds using two samples and two synth oscillators can be very sonically engaging, particularly once you start layering and exploring the comprehensive 16-slot mod matrix (which is comprised of 28 sources and 88 destinations). Like the REV2, Prophet X includes two digital effects engines (per-layer) which complement the sample and synthesis engines. For the Prophet X, DSI has also included a great sounding rotary speaker effect (with decent overdrive too) to use not just on the organ samples, but any other sounds too. As the effects parameters are modulateable you can use the mod-wheel/other sources to change rotary speed (and parameters available on the other effects too). There are several decent reverbs (room, spring, hall, super-plate) as well as two delays, anger, phaser, chorus, pan-spread, distortion (and the digital resonant HPF). In addition, there’s a separate digital high-pass/low-pass filter for just the sample engine (Tone) plus bit reduction (hack) and decimation (sample-rate reduction) for breaking up and granularising both engines. Let’s also not forget the per-layer MIDI syncable arpeggiator with five modes, and the up to 6-note polyphonic, key-transposable, 64-step sequencer (also clocks to MIDI but doesn’t output it) - handy as an ideas sketchpad or an extra layer to play back in sync with other hardware or DAW- created sequences. Zooming in some more, there are four envelopes (two are assignable with looping), four assignable MIDI-syncable LFOs per-voice, Slop (to emulate out-of-calibration synths), plus voice-panning, detuning, and much more! The fact that so much can be modulated at high rates with very easy setup shouldn’t be taken for granted and further mod destinations include sample start, length, centre and loop parameters, plus the dual-engine effects parameters (and you have ‘standard’ synth performance features available too, such as glide with several modes, hold, oscillator sync, chord memory, single/multi-triggering and up to 16-voice unison with unison detune). Once you have explored the myriad of processing options available for the samples/synth oscillators, you can employ the lovely 4-pole stereo SSI2144 Fatkeys LPF (made by chip company Sound Semiconductor) to sculpt your sound further. This new filter (based on classic SSM designs) sounds pretty clean (without resonance) but nicely upfront once a little resonance is engaged (the resonance at higher values is very characterful and self-oscillates too). There’s also a useful and great-sounding filter drive control which adds further texture, character, level and body to any sound. While there’s no analogue high-pass/band-pass/ notch filter option (or 2-pole mode), there’s a decent digital resonant high-pass within the effects engine (like the REV2), which helps with sound design and for removing extraneous low-frequency content. Finally, you can add effects from the dual modulatable effects engines (per-layer), record up to 6-note polyphonic riffs into the sequencer, or use the arpeggiator (per-layer). The Prophet X brings a wholly new/welcome sound to Dave Smith’s lineup. Due to its flexible and open sample-based architecture and tried and tested synth engine, it can cover practically any sonic ground. Like the Waldorf Quantum, the price is high but similarly the X is using the latest technology in a really musical/elegant way, while simultaneously pushing you into new sonic approaches/territories. If you want a synth that can quickly get you close to the sonic complexity of your DAW’s plugins (but without the fuss), then this is it!